Splash pages, you gotta love 'em. A blank canvas where the artist can hit you with a large dose of illustrated 'wow'. This week, a splash borrowed from Newsarama (thanks Dale), teasing (and I hope heralding) the return of the pre DC52 universe. 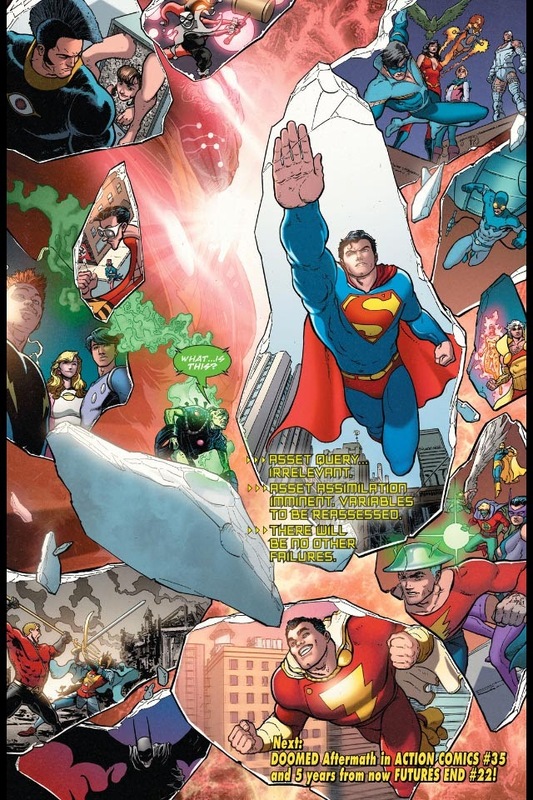 This splash page from the final page of Superman: Doomed #2 brilliantly illustrates everything that is so flawed (IMO) about the needlessly dark "new" universe DC has published over the last few years. From the JSA to a Captain Marvel that doesn't look like he stepped off Assassin's Creed, Ted Kord as Blue Beetle to the New Teen Titans together once more, this poster may be shown in fragments, but it is more unified than the current DC line has ever been. Here's hoping it is shown to be more than just a splash, when the 'crisis' it teases touches down in April 2015 with Blood Moon, an event to end all events, as the real life DC offices move from America's east coast, to the west. Thx for the shout out mate. Like with most things like this, I'm cautiously optimistic about what all this means. It's probably a fake-out, or perhaps the Didio regime is starting to reconsider bringing back, or more likely, PARTIALLY, bringing back certain elements of the pre-NU52 universe. I read the article on Newsrama, and it was speculated that with the 30th anniversary of the og CRISIS, either the pre-NU52 universe is brought back, but only to be sacrificed, or it's merged with the current one, I'd go for a merging, since it would be in the spirit of the original CRISIS, and the merging of all the worlds. As always, we shall see, but how cruel to tease us like this if nothing worthwhile is coming out of this, specifically as it pertains to getting "our" characters/heroes back. I'd also like DC to officially retire the whole CRISIS/rebooting concept as a whole. It served its purpose back in the day, but it really means nothing but a short-sighted sales boost now. That won't likely ever happen, but it needs to. Finally, congrats and big ups to Braniac for being the big bad. Someone up in DC land sure loves him. I think that's Geoff Dale. His work with Gary Frank on Action really tried to establish Brainiac as Superman's big bad and when you think of the concept, it's easy to see why. Still reckoned Brains could've been an awesome Man of Steel two foe. Heck he still just might be. Yep, especially if there's ever a Man Of Steel 3.